This is the message from 150408. 150327 had the same message box, but without the Process and Parent information. It seems that msvsmon.exe is a console program that is used to allow the debugger to attach to the unit test runner, and ConEmu tries to attach to it as well. I think that versions I had before (several months older) did not have this problem, so I'm not sure why this has been introduced. Other than making ConEmu recognize this special situation, I could think of two workarounds that would greatly increase usability for me: 1. Make the message box some label or log in the ConEmu window, rather than popping up a message box or 2. Add an ignore list where I could enter msvsmon.exe in this case so it would not try to attach. NOTE: I just checked that 140707 works fine in this situation. I'm not sure if that is the same, because you write that the debugger in VS has changed and ConEmu has not yet been adapted. But 140707 works fine, so it seems it's actually a regression in ConEmu. I've done some tests. First "broken" version was 141201. And I can't just revert the commit but need rewrite some stuff. Have you tried latest alpha? I have the same problem, and not just with VS (running the latest alpha version, 150722 as of this post). I will collect some screenshots/error messages and post them here for reference. I need at least exact steps and settings to reproduce that. I don't have any exact steps -- it's very random. I can send you my ConEmu.xml for the settings, however. 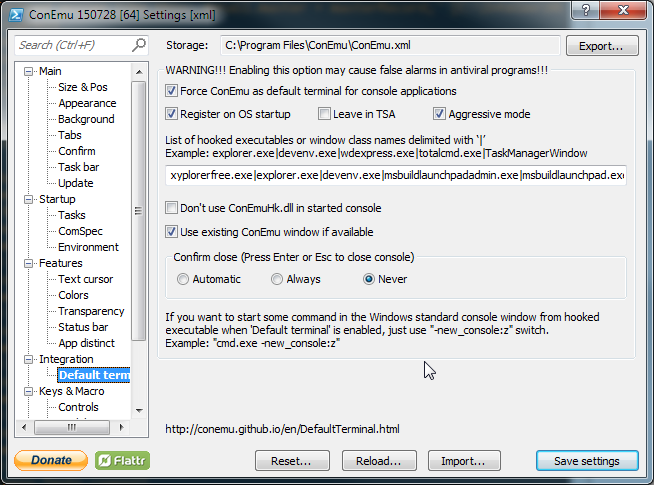 Screenshot of your DefTerm settings or the whole xml file. Take a look at process three (in ProcessExplorer) to determine if all PIDs are alive and the fact if ConEmuHk*.dll is loaded in all mentioned processes. Make screenshot of process tree with PIDs visible. If possible, I wish to get MemoryDumps of ConEmuC and the process in which ConEmuHk was failed to be injected. Also, do you use "Aggressive mode"? Try to disable it. For the details, I'll go to Process Explorer once the issue pops up again (ProcExp is always running in the background anyway 😄). And I'll see about grabbing the memory dumps as well. As you can see in the screenshot, I had Aggresive Mode enabled, but I have just disabled it. I'll keep you posted.